U.S. Representative Rashida Tlaib, wearing her traditional thobe, poses during her swearing-in ceremony on Capitol Hill, Jan. 3, 2019. For those of us living in Iowa, the 2020 presidential election season is at hand. Trump campaign ads are already airing on television while Democratic contenders like Elizabeth Warren and Kamala Harris are making their way to the Hawkeye State to build momentum for next year's caucuses. As the election cycle gears up, what remains to be seen is whether the Democratic Party has made any substantial progress on one of the great wedge issues of the 2016 elections: Islamophobia. Trump ascended to the presidency promising a "total and complete shutdown of Muslims entering the country," a promise that became policy when the U.S. Supreme Court upheld a scaled-down version of the ban in June 2018. His presidential campaign, of course, included other Islamophobic tropes and proposals, including flirtations with Muslim ID cards and Muslim registration systems along with assurances that "Islam hates us." Trump's campaign and early presidency also coincided with peak levels of violence targeting Muslims. According to the FBI, between 2015 and 2017, anti-Muslim hate crimes rose to their highest level yet. Only 2001 saw a higher number of hate crimes against Muslims. The Republican Party by and large has embraced Trump's Islamophobia as measured both by localized efforts to remove Muslims from party leadership and by the Republican National Committee's fearmongering over "creeping sharia," not to mention its support for the Muslim ban. Do the Democrats offer an alternative? But what about the Democrats? Do they offer a compelling alternative to the anti-Muslim racism that has infected so much of the Republican Party's platform and has been normalized in the age of Trump? 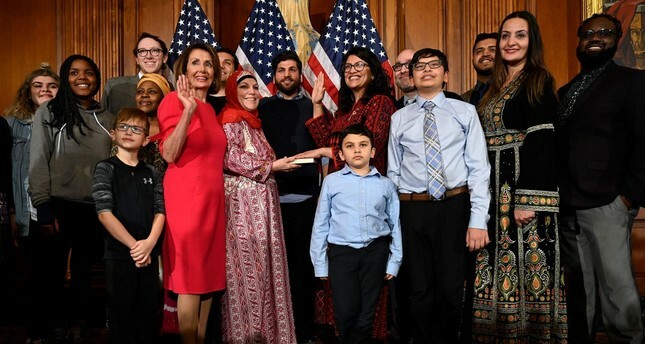 On the one hand, Democratic condemnations of the Muslim ban, along with the recent election to Congress of two Muslim women, Rashida Tlaib and Ilhan Omar, indicate that the party is capable of mounting resistance against Islamophobia. On the other hand, the Democratic leadership has often supported practices and policies that exacerbate Islamophobia. In 2008, campaign volunteers removed two Muslim women from behind Barack Obama's podium at a Detroit rally, presumably because of the bad visuals. Obama struggled in the same campaign to question the racism behind accusations that he was a Muslim. It was left to Colin Powell, the former secretary of state, to insist that there was nothing wrong with being a Muslim, even if Obama was not one. During the Obama presidency, the administration ramped up Countering Violent Extremism initiatives that presumed Muslims were guilty of harboring latent terrorist or violent tendencies and that relied on debunked theories connecting the observant practice of Islam with radicalization. Obama's persistent use of drone strikes, and the civilian casualties resulting from them, also perpetuated a militaristic policy that broadly cast Muslim populations as enemies and threats to national security. Hillary Clinton's 2016 presidential campaign continued to rely on narratives of Muslims as a suspect community whose belonging in America should be conditioned on their support for dubious counterterrorism policies that disproportionately target them. Most notably, she insisted at a presidential debate that we must resist Islamophobia because the nation needs "American Muslims to be part of our eyes and ears on our front lines" in the battle against terrorism. More recently, Clinton suggested Europe should limit the entry of immigrants and migrants (many of which are Muslims) in order to fend off right-wing populism. In doing so, she lent credence to the far-right conviction that Muslims, as opposed to anti-Muslim racism, constitutes the core problem facing Europe. The Democratic Party's most prominent leaders have struggled to articulate an effective response to Islamophobia and a compelling vision for the full inclusion of Muslims. While likely contenders such as Elizabeth Warren, Bernie Sanders, and Joe Biden have all condemned Trump's most Islamophobic policies and language, the jury is still out on whether they or other 2020 Democratic hopefuls will be able to help the party find its voice and its moral compass when it comes to countering systemic Islamophobia. In the case of at least one Democratic candidate, Tulsi Gabbard, there is a clear track record of blatant Islamophobic comments and activities. Gabbard routinely chastised the Obama administration for failing to use the language of "radical Islam," a position that ties terrorism to something inherent to Islam itself and that mirrors Trump's own beliefs. In 2015, Gabbard spoke at a conference sponsored by Christians United for Israel (CUFI). CUFI is led by the extremist pastor and Islamophobe John Hagee, who, among other things, believes the nation should be engaged in a "theological war" to halt the spread of "global sharia." What to do for the upcoming vote? The time has come for the leadership of the Democratic Party to develop arguments and policies against Islamophobia that are unconditional and unequivocal, grounded in an unflinching commitment to human dignity, civil liberties, and freedom of religion. The next round of Democratic presidential candidates should apologize for the party's hesitant embrace of American Muslims and make amends for what the party's leadership has said and done to Muslims, within and beyond our borders, in the name of national security and the war on terror. Anything less sends the message that the Democratic Party remains a marginally better but still lackluster alternative to Trump and the Republicans when it comes to addressing and dismantling Islamophobia. With Muslim lives and livelihoods on the line, the nation cannot afford another underwhelming Democratic response to Islamophobia in the race for the White House. * Associate professor of religion at Luther College in Decorah, Iowa, and a former adviser on Islamophobia in Europe at the U.S. State Department in Washington, D.C.